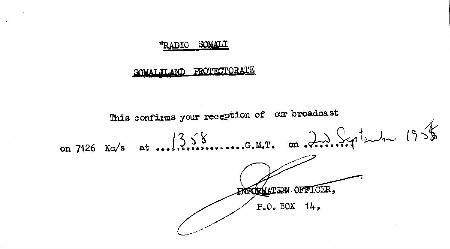 QSL card from Radio Somali, Hargeisa, Somaliland Protectorate, for report on 22 September 1955 on 7.126 MHz. Power was 1000 watts. 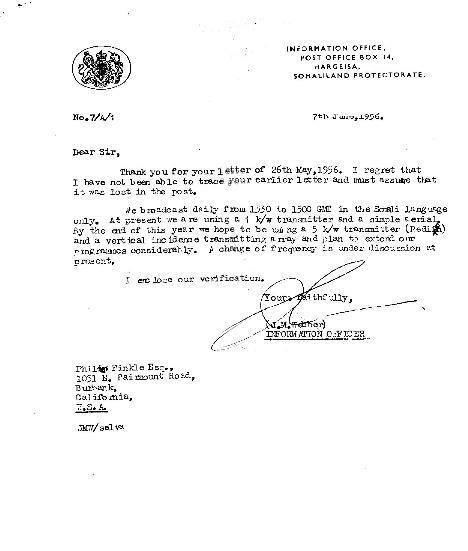 Somaliland Protectorate was under British authority until it joined with former Italian Somaliland to form the Somali Republic in 1960. This area is the northern part of today's Somalia. This was a rather rare "catch" from the west coast of the U.S.A.